I met Jessica on the Internet. There, I said it. I know it sounds weird but we both had garden blogs and somehow found each other and learned we lived just blocks apart in Forest Park and that we were both originally from Tennessee. Within 12 months of meeting, we’d partnered to start Forest Park Community Garden. I have never met anybody so easy to work with. Not only did we share a vision about creating a local community garden but the synergy between us was amazing, comfortable, fast! While writing this blog post for Green Home Experts it occurred to me that I’ve never really talked to Jessica about her gardening experiences prior to when I met her. I just know that ever since then she’s been on fire trying to figure out a way to make a living doing something she loves. Urban agriculture. This year Jessica started Forest Park Mini Farm, a small farm located on a piece of land owned by the Village of Forest Park and leased to her for growing herbs, flowers and fresh, organic produce. 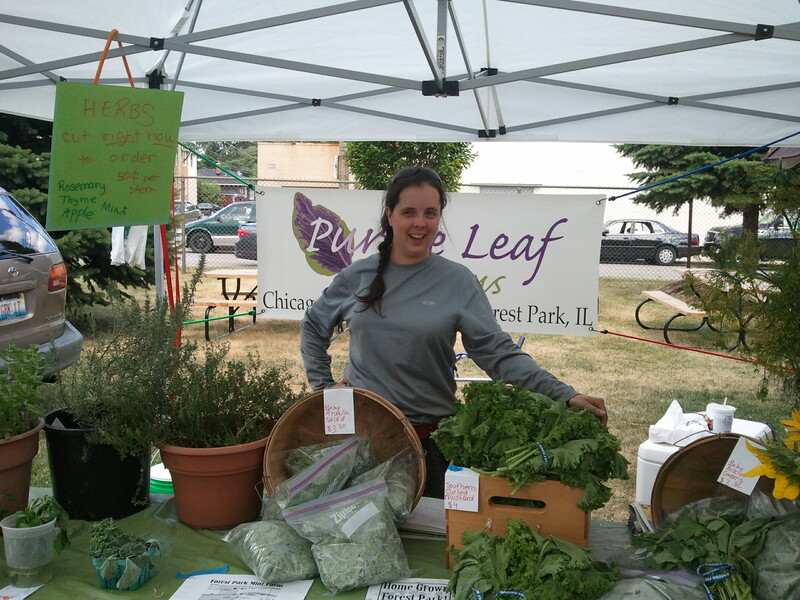 Jessica sells what she grows at Forest Park Farmers Market every Friday evening and she is also offering shares of her harvest for sale just like large-scale Community Supported Agriculture farms do and she’ll even deliver to your home for free if you live in the area. I am proud of Jessica for relentlessly pursuing her urban agriculture dream and for her innovation in working with local government to utilize the empty land they own to provide space for eager farmers like Jessica. Most communities have these parcels of land waiting to be developed and allowing them to be farmed in this way is a very safe investment that sends a strong message to the community that they support residents with this entrepreneual spirit and a lot of sweat equity to give. It’s cliché but it nobody loses here. Jessica still has a few shares available for her Community Supported Agriculture program which starts this coming Friday July 20th. If you live in the Oak Park, River Forest or Forest Park area, you can’t get much more local than purchasing produce from this exciting new mini farm. If you decide not to buy a share, be sure to stop by the Forest Park Farmers Market on Friday evening 3:30 – 7:30 at The Grove where you can buy Jessica’s produce and beautiful flowers, in person. Winging It, by Debbie B. They say that if you ask ten beekeepers a question, you’ll get 12 answers. Maybe it was always that way, because of the nature of beekeepers, but with all the challenges bees are facing these days, there are no simple answers. Many of the questions have to do with pest management–the bees are plagued with parasitic mites, and there’s a new kid in town, the small hive beetle. Beekeepers are also constantly puzzling out how to treat viruses without killing bees or affecting the honey. And how to keep the bees alive over the winter can spark quite a conversation. Even a question as simple as whether to keep feeding the bees supplemental sugar syrup has at least three answers: Yes, no, or “as long as they keep taking it”. You can see sugar syrup in the photo of the hives below–it’s in the spaghetti-sauce jars, which fit into a contraption known as a Boardman feeder. So I’m just winging it, too, alone in my backyard with two brand-new hives of bees. I’m amazed by how different the personalities of the hives are. One is doing everything by the book and coming along well; the other is a hive of mavericks and rebels who are raucous and will fly right into you if you’re in the way. Their behavior is related to the temperament of the queen. I kind of like the more assertive girls and am interested to see which hive does better. In the photos below, guess which hive is the ‘party hive’ (can exterior decoration affect a bee’s mood?). In the close-up, you can see several bees who have just come back from foraging–they have yellow-orange lumps on their back legs, where their pollen baskets are. 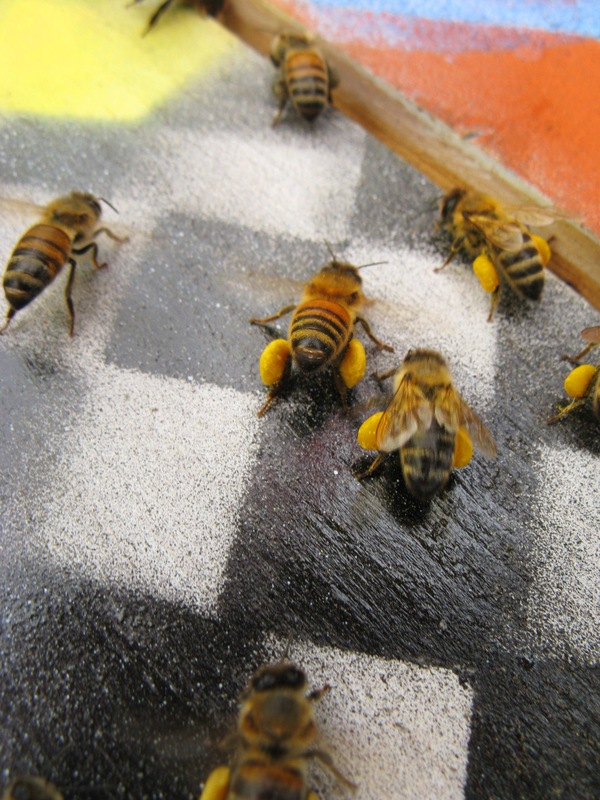 The pollen will be stored in the comb for later consumption–it’s the bees’ source of protein. Coming up is National Pollinator Week, June 18-24 this year. How will you celebrate? Bees never come when the suppliers say they will. Almost always, the delivery date is two to three weeks later than promised. My bees were first supposed to come April 25–now, due to weather and scheduling issues, they are supposed to become part of the Oak Park landscape on May 12. I’ve been putting this waiting period to good use–it’s given me plenty of time to talk bees with the locals. Green Home Experts’ own Maria Onesto Moran, who is doing a wonderful job as my agent, arranged for me to appear as a beekeeper at Oak Park’s Earth Fest, and at two screenings of ‘Queen of the Sun’ during the One Earth Film Fest. At all three events, visitors and viewers impressed me with their knowledge and interest in beekeeping. Along with insightful comments and information. 1. There have long been feral beehives in trees in Oak Park. 2. The Chicago Honey Co-op has established a beeyard with more than 20 hives within four blocks of Oak Park. 3. Beekeeping supplies are now available in Chicago at Belmont Feed & Seed, and at Christy Webber Landscapes Farm & Garden Center. 4. Some local animal shelters have become overwhelmed with chickens–because people have been buying chickens without really knowing what they’re getting into, and decide it’s for the birds just as fast. I worry–will there be a rash of similarly feckless beekeepers? 5. The Illinois Department of Agriculture has let the urban beekeeping community know that, due to this year’s early spring, the Ag Dept. has been getting way more calls than usual about bee-swarm removal, and also, a lot more calls from residents of Chicago saying they are uncomfortable with their neighbors keeping beehives. And some said, when they complained to their neighbors, the beekeepers refused to work with them on a solution. Too many complaints will put Chicago’s unrestricted beekeeping at risk. This has started area beekeepers thinking that we need to be a lot more proactive. While we already swarm ‘green’ events and talk passionately to anyone who’ll listen about the benefits of honeybees, we need to find a way to reach people who have never even thought about where honey comes from, much less about how pollination works. And we would like to reach out to prospective and new beekeepers. If anyone reading this would like a beeyard tour or to be mentored, please speak up! 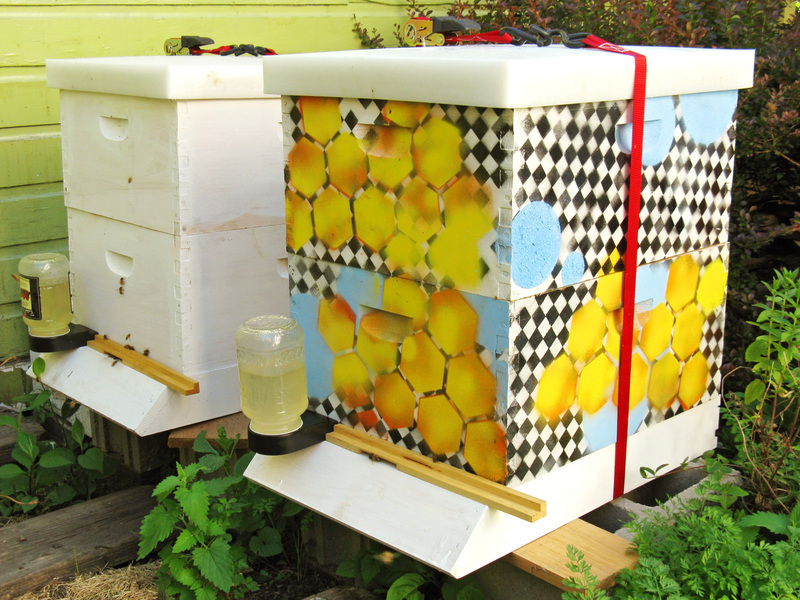 To do this month: Install bees!!! Feed with sugar syrup and pollen patties to keep the bees going while they produce wax–one flake at a time from a gland in their abdomens–to make comb to store nectar and pollen. Inspect the hive within one week and every 1-2 weeks after that, looking for the queen, or at least making sure she’s laying eggs. Comments: Tomatoes should be firm and fully colored. Tomatoes turn pink when mature. During hot summer weather, pick your tomatoes every day or two. A few years ago I had the pleasure of meeting Sharon, a customer who quickly became my friend and garden godmother. Sharon is a caring, nurturing woman who always has the right words, is infinitely wise in gardening, is handier than most handymen I know, and lights up the shop whenever she walks in. Sharon is a member of the Squash Blossoms and now manages their blog. So now you’ve gotta love the gal! Lucky for us–lucky for you, perhaps–Sharon will be stationed at GHE next weekend, Beginners Weekend, to help blossoming gardeners. Sharon will be available all day on Saturday, May 5th to help you plan your garden for a very successful season. Many of us are getting into gardening for the first time. Gardening seems to have skipped a generation in many families, and Sharon is here to fill that void. Some people have Mom, Dad, Gramma or Grampa to call on for gardening advice. Others have Sharon! If you’d like to get your garden off to the best possible start, email us at gogreen@ghexperts.com to schedule an appointment with Sharon on May 5th. You’ll receive a confirmation email in response. Consultations are free and will last 20 minutes. Bring any ideas, drawings, pictures or questions you have! Trees, shrubs, perennials and cool season annuals (hello pansies!) can be planted. Cool season crops can be planted: leafy greens such as kale, spinach and Swiss chard; root vegetables such as radishes, carrots, beets and potatoes; and climbers like peas are all cool season crops. Hold off on peppers, tomatoes and delicate herbs like basil until temps are averaging 70 degrees or more and evening temps are above 50. Trim back ornamental grasses to 6″ or less, cut back browned perennial foliage; this early spring you should see many perennials already coming up so it makes the job easier to make way for the new growth. Prune off “dead” wood from roses. Knockout (shrub) roses can be left alone to achieve greater size this year or trimmed back; your choice. You still can remove any dead growth for a tidy appearance. Now is a good time to divide later blooming perennials; Aster, Iris, Sedum and Hosta are all great candidates for division. Simply remove the plant from the ground, slice it in half through the roots and reinstall as two separate plants. What a great money saver and garden expander…you may even want to share with friends! For more tips on eco-friendly gardening and organic lawn care, visit Dig Right In Landscaping’s website and Facebook.